One evening earlier in the week, I was tending to the two parrots that share my office. While I was changing their water and getting them settled in for the night, I noticed we were not alone. In this case, I am not referring to the four dogs who “help” me get Harley and Milo ready for bed every evening. A tiny tree frog clung to the outside of the picture window that overlooks the creek. He had discovered that the lights left on for the parrots indoors made bug hunting an easy matter for anyone who could cling to the glass outdoors. 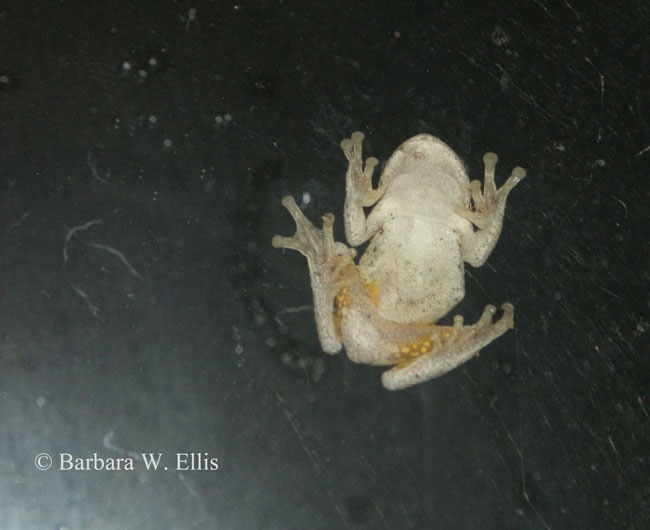 I’ve seen tree frogs on the window a couple times before, but this is the first time I got pictures. When it comes to wildlife, I always am curious about exactly what is visiting, so identification was in order! A little bit of research in my trusty field guide, Amphibians and Reptiles of Delmarva by James F. White, Jr. and Amy Wendt White narrowed down the i.d. 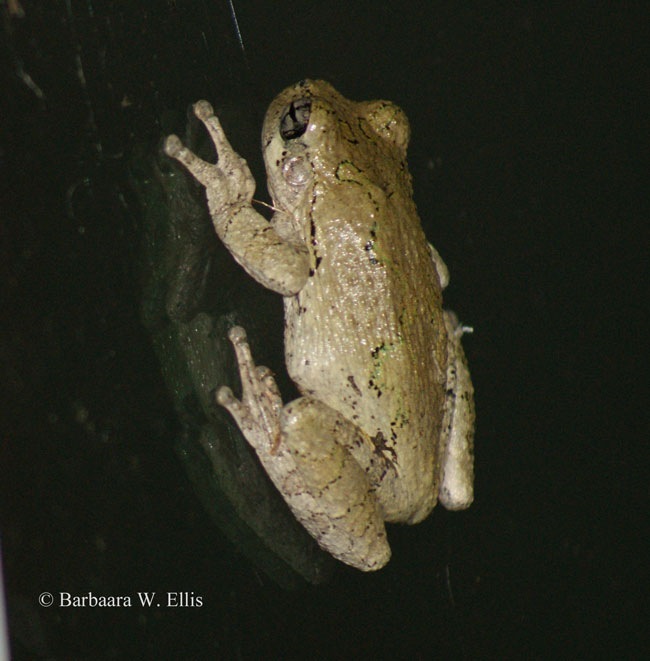 to either Gray or Cope’s Gray Treefrog. (I’ll admit I looked at Northern Spring Peeper first, but my visitor had large round toe pads, which you can see in the picture, like all treefrogs do. It also lacked the peeper’s characteristic “X” on the back.) I also looked on the internet, and that lead me to Maryland Department of Natural Resources Discover Maryland Herps, which had additional pictures plus links to the calls of each species. On both species, color varies from gray to grayish green with a white or lighter spot below the eye. Amphibians and Reptiles of Delmarva also notes that, “color can change depending on activity level, temperature, and activity.” It goes on to say that, “The hidden surfaces of the hind legs are bright orange or yellow with black mottling.” My photo from inside my office caught the orange-yellow color precisely, but I didn’t notice any of the black mottling. These are tiny frogs, although the pictures make them seem huge. Size varies from 1.3 to about 2 inches. Gray and Cope’s Gray Treefrogs can only be told apart by their call and by chromosome count (Cope’s Gray is diploid; Gray, tetraploid), so I’m satisfied getting my i.d. down to one of two species. Next spring and summer I’ll study the calls (I have frog calls on my I-pod!) and will see if I can determine which species I hear. Males begin calling in April and breeding continues through late June. Treefrogs need a combination of wetland and woodland in order to survive—another reason I strive to provide both in my garden. In addition to ponds, creeks, bays, and other permanent bodies of water, they also breed in ditches and vernal pools—temporary pools that usually lack fish or other predators. According to the website, they are most often observed on branches of trees and shrubs that hang over the water, and are found in deciduous woodlands and mixed deciduous-coniferous woodlands. Both species spend most of their time in trees and shrubs hunting for insects and other invertebrates. Thanks for proving my little theory that great gardeners are also wonderful observers with intense curiosity! The longer I garden, the more I want to know, and I have to say I adore having a digital camera for the instant-gratification thrill of capturing the garden and its residents in pictures. Looking at the flowers and foliage are great, but more and more, I’m thrilled by all the wildlife I have invited. Great pictures of the frog. Good thing your camera was handy.